Since I follow Alexis Hall on Twitter, I was aware of this short story before being offered it for review. A futurist fairy tale involving mermaids? I couldn’t say “YES!” fast enough. 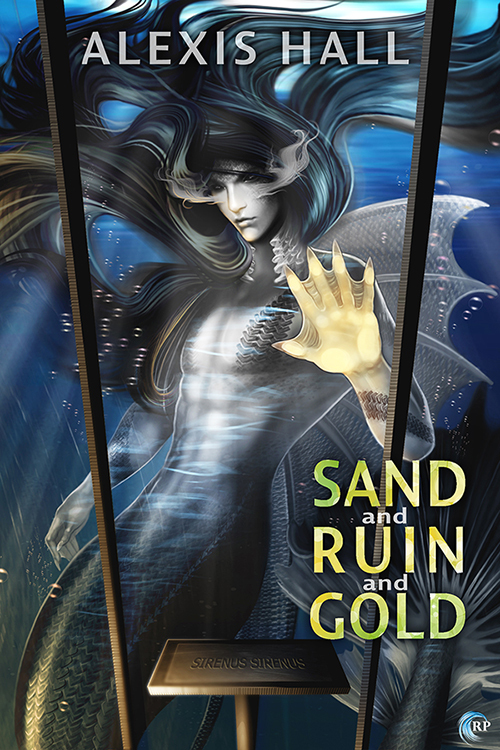 SAND AND RUIN AND GOLD tells the story of an unnamed prince, fashioned by scientists for his father, the king. As a young boy, he’s taken to the Cirque de la Mer, to watch the merfolk perform (as a read I envisioned the Cirque to be a fantasy version of SeaWorld). He falls in love with the idea of the Mer an,d on his eighteenth birthday, runs away from home. The story that follows is one I read with a sense of unease. Though the Cirque cares for the Mer, they are still wild creatures in a cage, and they exhibit behaviour often found in dolphins and orcas in the real world. As someone who dislikes marine parks, I found the parallels somewhat disturbing. Yet, the prose is beautiful and haunting, painting a picture of an attraction who fading popularity is affecting both workers and Mer. Things change when the Cirque takes on three new Mer: female Melantheia, who’s pregnant, and male Nerites. Almost immediately the prince connects with Nerites on a deep, emotional level that his upbringing leaves him incapable of figuring out. It becomes an obsession and, eventually, leads to a desperate move that endangers them both. I don’t really know how to describe SAND AND RUIN AND GOLD. The prose is literary; some times flowing, at others choppy. It’s beautiful but heartbreaking. It captures and disturbs you in equal measure. It’s dark and light and absolutely exquisite. It stays with you long after you finish reading. And you should read it. ← As You Were – How much do you love your tech?